Demtec DT-3016 available from Transplant Systems is a range of versatile potting machines designed to work automatically with pots sized from 7cm to 26cm and 26cm to 36cm. 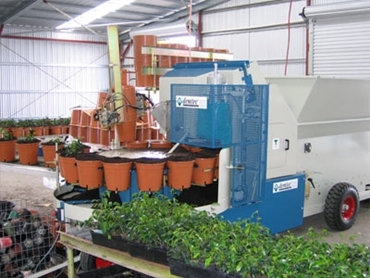 Powered by a 3-phase connection, Demtec-3016 potting machines feature a solid chassis and a large hopper of 3000L capacity. The machine’s versatility comes from its use of 8-station and 16-station potting rings, both featuring centralised adjustment. Offering user-friendly operation, the machine allows quick adjustments between different pot sizes. The potting machines come complete with large pneumatic tyres and towing arm. Standard accessories supplied with the potting machines include pot dispenser, automatic pot take-off arm and conveyor to meet specific requirements of width and length.